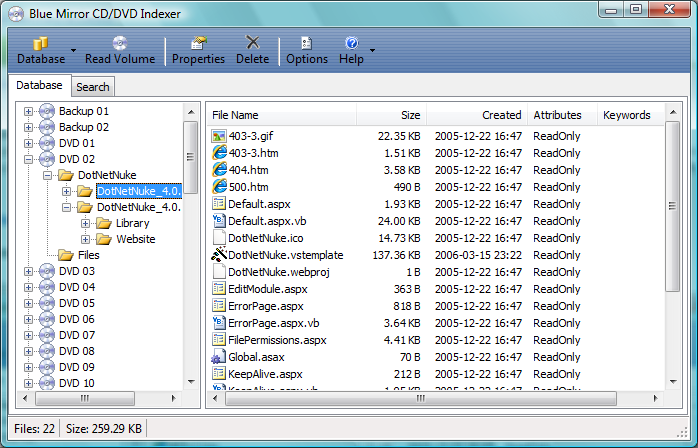 Do you have a huge collection of CD’s and DVD’s or use a huge external HDD for achieving data then it can be a tedious task of popping in each and every CD/DVD and going through the files.You can locate files on CD/DVD/External HDD’s easily by creating an searchable index of the CD/DVD using Blue Mirror CD/DVD cataloguer application. How to Create and Search CD/DVD Index. Just insert your CD or DVD and click Read Volume button and select the drive to create, provide label name, keywords separated by semicolon (;) a full structure of a CD or DVD is created and visible under Database tab and takes only a few seconds for this. The next time you need to locate a file, just click the Search Tab to search the index and locate on what Label Media the file is in.You can search volumes using keywords using advanced search. You can also export your database of CD/CD labels and import them later using the merge option, Both these functions are available under DataBase but the only drawback I found was that this application works only on the Windows Platform and requires .Net Framework installed.